Gandalf the Grey has plenty to be worried about as he teams with Bilbo to defend the lost Dwarf Kingdom of Erebor in The Hobbit: The Battle of The Five Armies. 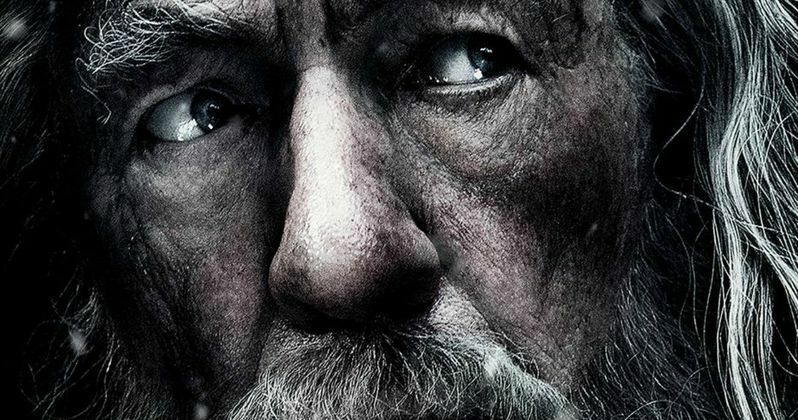 That concern is written all over Ian McKellen's face in the latest character poster for The Hobbit: The Battle of The Five Armies. The great enemy Sauron has sent forth legions of Orcs in a stealth attack upon the Lonely Mountain, which has gone unseen by any except the great Wizard. As darkness converges on an escalating conflict, the races of Dwarves, Elves and Men must decide to unite or be destroyed. Will Gandalf be able to unite them all? In anticipation of this ultimate battle, Warner Bros. is asking you to decide on which character poster gets released next. The votes are in for today, with Ian McKellen's Gandalf spotlighted in anticipation of this defining chapter in Peter Jackson's Hobbit franchise. But now that Gandalf has been freed, its up to you to choose who comes next. Just hash tag and tweet either #Tauriel or #Galadriel to vote!